BitFenix presents Raider, a mid-tower ATX case with four USB 3.0 ports, three 120mm Spectre fans, an integrated fan controller, SoftTouch surface, and a removable HDD cage wall. The MSRP is 79EUR (incl. 19% VAT, and $89 in the US). 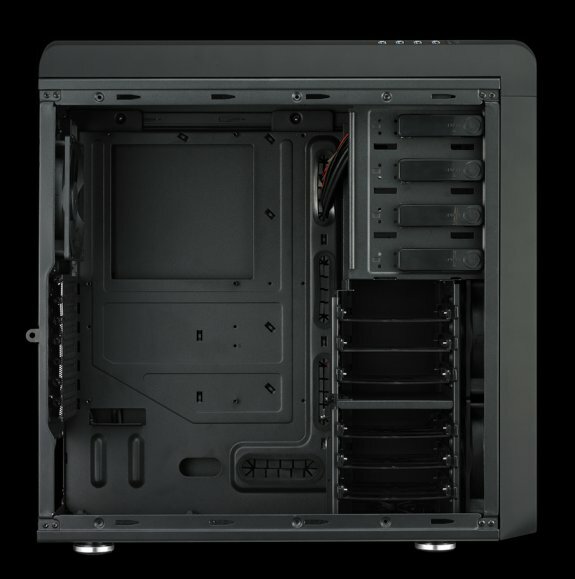 Today, premier PC hardware designer BitFenix is pleased to announce our latest mid-tower ATX chassis design – Raider. Unlike other competing chassis that bundle run-of the-mill fans, Raider comes equipped with no less than three premium BitFenix Spectre™ fans for unmatched cooling performance. As the world's first chassis to offer four SuperSpeed USB 3.0 ports, Raider combines advanced features with a sleek maximum airflow design for an unstoppable combination of aesthetics, performance and function. "Our Raider is about all-out aggressive cooling," says BitFenix Product Manager David Jarlestedt. "With features like four USB 3.0 ports, integrated fan control, Spectre™ cooling and an all-new design, Raider is ideal for users who require the ultimate in air cooling performance." Like the unstoppable warrior it is named after, Raider is relentless when it comes to getting the job done. It begins with a sleek mesh design that not only promotes maximum airflow to your installed components, but also exudes the BitFenix design philosophy of clean and modern styling with signature BitFenix SofTouch™ Surface Treatment. Adorning the top of the case are four USB 3.0 ports, ideal for connecting an ever increasing variety of SuperSpeed peripherals. To keep components cool in any situation, Raider comes loaded with three premium 120mm BitFenix Spectre™ Fans for excellent cooling and low noise. And for complete control, the integrated fan controller gives you control of up to five fans with a convenient slider. Moving to the inside of Raider, users will be treated with numerous expansion possibilities with space for up to four 5.25", six 3.5" and seven 2.5" devices. The specially-designed removable hard drive cage wall allows gamers to install extra-long graphics cards while maintaining Raider's structural strength. And if even more cooling is required, users can utilize the Raiders five fan locations, with two of these able to accommodate huge 200mm fans. Best of all, all fan intakes are equipped with dust filters to let cool air in and keep dust out. Working with your system should be a no-nonsense affair, which is why Raider is loaded with DIY friendly features to help you get your system battle-ready in no time. Tool-free drive locking mechanisms make it easy to secure your drives, while a large CPU cooler cutout allow users to swap out CPU coolers without removing the motherboard. Raider also comes with plenty of cable management features, and rubber grommets to protect your cables and reduce air turbulence inside the chassis. And to keep noise in check, the power supply area features anti-vibration pads to help absorb vibrations from the power supply fan. As a BitFenix product, Raider is crafted with the utmost quality and exacting attention to detail that BitFenix is known for. From the brushed metal BitFenix logo and mesh PCI slot covers, to the fully coated interior and all-black cables, Raider users will be able to experience the BitFenix difference. 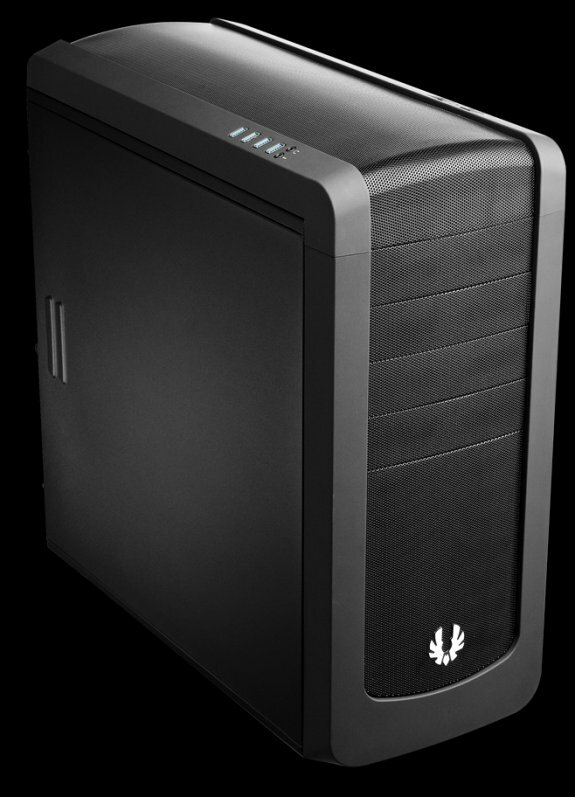 BitFenix Raider will be available on store shelves beginning December 2011 with an estimated MSRP of 79€ (incl. 19% VAT) and $89.